The first image of Henry Cavill as Superman in Zack Snyder’s Batman v Superman: Dawn of Justice has been posted on the movie’s twitter page (@BatmanvSuperman). 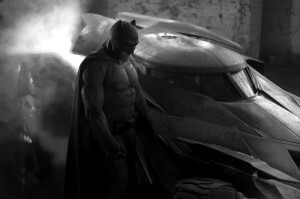 If you’re anything like us at Flicks And The City, you’re already pretty excited for the follow up to 2013’s Man of Steel, especially after the images of the Batmobile and Ben Affleck’s Batsuit were released a couple of months ago. The Superman suit itself is very similar to the one he wore in Man of Steel – it’s hard to go wrong with such an iconic suit – but the lighting of the photo, as we had with the Batsuit photo, hints at a dark, brooding tone for the film. 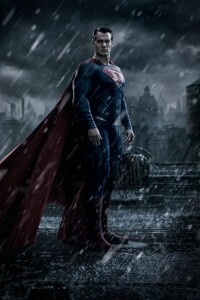 The background of the photo is perhaps the most interesting part – it looks a lot like Superman is in Gotham City. The Batsuit itself is very reminiscent of that worn by Batman in Frank Miller’s legendary comic series The Dark Knight Returns, which sees a 55-year old Bruce Wayne who has put down the cape and cowl but gets drawn back in. What would bring Superman to Gotham we can only speculate, though the Man of Steel appearing in his backyard is bound to ruffle Batman’s feathers – maybe enough to bring the aging vigilante out of retirement? It is expected that the film will feature some attempts to rebuild Metropolis after the destruction created at the end of Man of Steel. This could perhaps be achieved using Lex Luthor’s (Jesse Eisenberg) money, or perhaps Bruce Wayne will get involved here. Though we know little of the plot of the film, it has the ambitious task of setting up the landscape for the Justice League film that will follow. As well as DC’s ‘big two’, we’ll be introduced to a number of other Justice League members in Dawn of Justice. Already cast (so far) are Gal Godot as Wonder Woman, Ray Fisher as Cyborg, and Game of Thrones’ Jason Momoa as Aquaman. It is expected that these may be no more than cameo roles in Dawn of Justice, setting their characters up for larger roles in Justice League, which will be shot back-to-back with this. The movie is still a long way off, but expect a steady stream of news and tidbits as the movie gets underway. Batman v Superman: Dawn of Justice is due for release on May 6 2016.